The Consumer Electronics Show (CES) always has some new gadgets that catch my eye and it sometimes put it on my wish list considering how the price of the item will come down considerable by time I even think about saving my coins. BMW has trumped the CES show this year with their new ActiveAssist technology enabling the ‘system’ to perform automated drifts. That is right, your BMW could one day be a virtual Ken Block or just take over driving duties in heavy traffic or stop you in time before you plow into the nearest object in front of you. Sure, these technologies are really nothing new, but BMW has taken them all to a new height to combine an integrated system like no other. Hit up the full release below for the full details and explanations of each individual system and watch the video on how it can “Assist” your new Bimmer. 1. Camera-based assistance systems bring enhanced safety into new vehicle classes. 2. BMW ActiveAssist and new control systems revolutionize Sheer Driving Pleasure. The BMW Group uses its ConnectedDrive banner to group together unique and innovative functions which link the driver, vehicle and outside world intelligently with one another. These functions enhance comfort, allow customers to experience a new dimension in infotainment and significantly improve the safety of BMW Group vehicles. To this end, BMW ActiveAssist – the package of partially and highly automated driving technology developed by BMW – will make a significant contribution to bringing the vision of safe and accident-free mobility another step closer to reality. The BMW Group has been conducting research into the various expressions of this idea for many years with this goal in mind. BMW ActiveAssist, as part of BMW ConnectedDrive, pools all the technological developments in this area. The BMW Group is using the Consumer Electronics Show (CES) 2014 in Las Vegas to present a new element of BMW ActiveAssist: a safety assistance system which brings the vehicle back into line in demanding driving situations without any input from the driver. Precise and reliable vehicle control at the dynamic limit is a central building block in the development of highly automated driving. Only a system that can safely master all dynamic situations up to the vehicle’s dynamic limit will be able to generate trust and provide sustained and secure relief for the driver in tiring situations. The experts at BMW Group Research and Technology have built a research prototype with perfected control technology in pursuit of this goal. The prototype can pilot its way at high speeds and with exceptional precision on a slalom run between cones, adheres to a marked out circular course regardless of the friction coefficient of the road surface, and executes an obstacle-evading lane change to perfection. It makes optimum use of the potential of both engine and chassis. Even when deliberately provoked into oversteer – the clearest way of highlighting a vehicle’s dynamic limit – the highly automated prototype follows its path safely and along almost identical lines time after time. While the control systems fitted to today’s vehicles restore stability by braking individual wheels, this new function introduces active and precisely calculated steering inputs into the mix. The research prototype reacts to fluctuating grip levels – the kind experienced in sudden hydroplaning – with the precision of an expert driver. The car continues along the predetermined target line, but does not attempt to maintain a preset speed under all circumstances. Instead, it constantly factors in the condition of the road surface and responds intelligently as required. The sensors delivering the necessary information are the same as those fitted as standard on today’s vehicles and also send data to the DSC system, for example. Understeer – where the car turns less than the driver intended – is dialled out by opening the steering. And a sliding rear end (oversteer) is caught using a carefully gauged combination of countersteering and brake inputs. The programmable electronic steering required to make this possible carries out carefully targeted, rapid and flawless adjustments, and is fitted as standard on all current BMW cars. The prototype illustrates the BMW Group’s aspiration to offer its customers a highly automated driving experience exuding emotional appeal – even at the car’s dynamic limit. Many years of experience in vehicle automation. With BMW ActiveAssist, the BMW Group is once again leading the way worldwide in the implementation of safety-enhancing and highly automated systems. Back in October 2009 the BMW Group rolled out its BMW Track Trainer research project to showcase highly automated driving on the ideal line around the Nürburgring-Nordschleife, the world’s most demanding race track. Developed by engineers at BMW Group Research and Technology, the BMW Track Trainer later demonstrated its effectiveness on the Laguna Seca, Zandvoort, Valencia, Hockenheimring and Lausitzring circuits. Here the research engineers collected important practical experience regarding vehicle control and position location in extreme conditions. The BMW Emergency Stop Assistant research project added further important insights to the knowledge pool. If the driver is incapacitated – e.g. by a medical emergency such as a heart attack – this function can switch the vehicle into highly automated driving mode, steer it safely to the side of the road and automatically activate an emergency call. These developments paved the way in 2011 for a test vehicle to drive on a multilane highway in highly automated mode. The research prototype covered 65 kilometres (40 miles) between Munich and Nuremberg, accelerating, braking and overtaking other cars along the way without any driver intervention. It did so while observing the traffic laws at all times and kept pace with the traffic at speeds of up to 130 km/h (81 mph). The prototype has since covered approximately 15,000 kilometres (9,300 miles), over which the development engineers have gained important insights into the behaviour and response strategies of their highly automated vehicles. The starting point for the development of this driving strategy is the secure location of the vehicle within its lane and, above all, the reliable recognition of all vehicles and objects in the immediate vicinity. A key role is played by the fusion of data from various mutually complementary sensor technologies – such as lidar, radar, ultrasound and camera detection – fitted on all the test vehicles. Despite this 360° detection capability, there is little on the outside to tell the vehicle apart from a series-produced model. The next step in the development of highly automated driving functions came in June 2013. The research vehicles not only made highly automated progress along the highway, they also completed complex changeovers from one highway to another at intersections fully automatically. Highly automated driving in a 2015 fleet trial. Since February 2013 the BMW Group and international automotive supplier Continental have been working together to take the next concrete steps towards the implementation of highly automated driving functions. This research partnership will run until the end of 2014 and involve the introduction of several test vehicles with close-to-production technology. The BMW Group’s next major goal as part of this cooperation is to introduce highly automated driving on European highways and tackle the challenges that this will bring – such as crossing national borders and negotiating road construction. BMW conducted fleet trials as part of its research activities into electric mobility, collecting valuable experience with the MINI E and BMW ActiveE. These trials produced important pointers for the ongoing development of electric mobility, and the new BMW i3 is the first model to benefit from these findings. 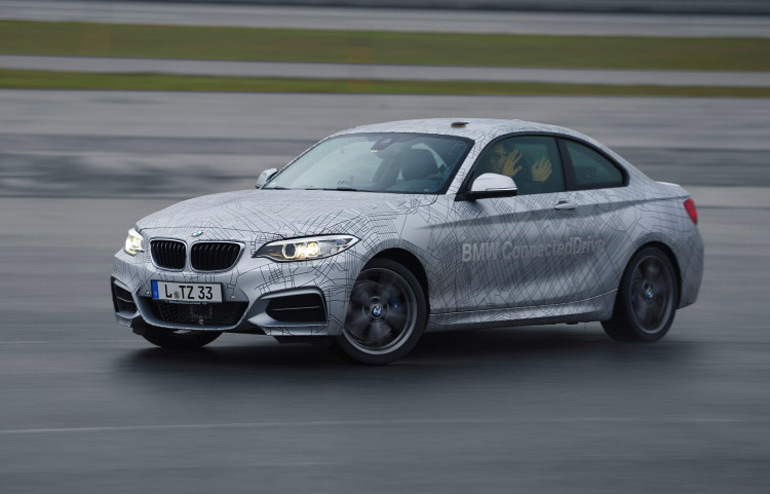 This successful testing principle will also underpin a fleet trial for highly automated driving in 2015, which will see the BMW Group once again assume a leading role in the development of highly automated driving functions. By 2020, the technical foundations should be in place for a highway-based system that will allow highly automated driving in series-produced vehicles. 3. Samsung Galaxy Gear with BMW i Remote App functions. The BMW i3 – with its integrated SIM card – is the world’s first fully connected electrically powered car; in no other model will you find such a high level of interaction between the driver, vehicle and outside world. The presentation of the BMW i3 brought with it the debut appearance of the BMW i Remote App, which allows drivers to share information with the vehicle at any time via their smartphone. They can check whether the windows are shut, for example, or lock the car remotely. And now BMW is using the CES to present a new research prototype – the Samsung Galaxy Gear™ with BMW i Remote App functions. The arrival of smartphones has changed our everyday lives for the long term, with internet and digital services now something we take for granted. Wearable devices like the Samsung Galaxy Gear can further boost this trend and fundamentally change the way we use mobile devices all over again. The Galaxy Gear is worn on the wrist and cleverly complements the linked smartphone. Users can view important information on the Gear without having to take their smartphone out of their pocket, unlock a screen or enter a code. The BMW i Remote App research application developed by BMW greets the Samsung Galaxy Gear user’s first glance with not just the time, but also the BMW i3’s range on electric power, battery charge available and any inputted departure times. Using the Galaxy Gear’s touch display to click on the figures sent by the application opens a sub-menu containing more detailed information, which is presented in the hallmark classy colours and style of BMW i. Another sub-menu informs the user of the vehicle’s current status, such as if any of the doors, windows or the sunroof are open – data which is also offered by the BMW i Remote App. The research application additionally enables users to send navigation destinations to their vehicle and to regulate the climate on board – all of which provides a fine complement to the Gear’s ability to deliver information quickly, directly and in real time. The Samsung Galaxy Gear with BMW i Remote App functions research prototype represents an excellent smartphone add-on for linking customers seamlessly with their BMW mobility ecosystem. At the same time, the application is proof of how quickly BMW ConnectedDrive can and will react to the rapid pace of innovation in the entertainment and infotainment sectors through the introduction of clever solutions. 4. New assistance systems enhance comfort and safety. The BMW Group has taken advantage of advances in camera technology to develop a generation of assistance systems based exclusively on vision-based sensing. These systems use information acquired by a mono camera mounted in the base of the rear-view mirror. Such data has long been used by systems like Speed Limit Info, which combines camera and navigation data to keep the driver informed at all times about fixed and variable speed limits. Camera-based applications offer similar functionality to radar-based technology, but are better at detecting stationary obstacles. Although they have certain requirements in terms of light conditions, such systems have a wide vision angle which makes it possible to detect vehicles that are pulling out or cutting in in front of the driver’s vehicle, even if they are right at the edges of the driver’s field of vision. Camera-based systems can therefore help to improve safety in market segments where there has previously been no demand for expensive radar-based applications. The camera-based systems Cruise Control with Stop & Go function, Collision Warning and Pedestrian Warning with City Braking function, and Traffic Jam Assist are all already available in the innovative BMW i3 in many markets. The new Parking Assistant, meanwhile, is based on ultrasound sensors. The system can provide both lateral control – i.e. steering – and longitudinal control, comprising braking, acceleration and switching between forward and reverse gears. The system sets new benchmarks in the field of automated parallel parking technology. Collision Warning and Pedestrian Warning with City Braking function. The new BMW assistance system Pedestrian Warning with City Braking function significantly improves pedestrian safety in urban environments. The movement patterns of pedestrians in urban traffic environments vary greatly, with frequent sudden stops or changes in direction. Monitoring pedestrians’ movements therefore poses a considerably greater challenge for assistance systems than monitoring preceding vehicles. Collision Warning and Pedestrian Warning with City Braking function operate in the typical city speed range between 10 and 60 km/h (6 and 37 mph). If the system detects a pedestrian or a stationary vehicle, it emits an audible and visible signal to warn the driver, and primes the brakes. If the driver fails to react by stepping on the brake or by steering away from the hazard, the system acts autonomously to reduce vehicle speed. This will ideally prevent, or at least mitigate the severity of, a collision with a pedestrian or vehicle. With the mono camera, Collision Warning and Pedestrian Warning with City Braking function use the same proven basic technology as other assistance systems such as Lane Departure Warning. Camera-based Cruise Control with Stop & Go function. The camera-based Cruise Control with Stop & Go function eliminates the need for drivers to constantly make minor corrections to their following distance and speed when driving in heavy traffic on highways, on dual carriageways and, especially, in urban environments. With its ability to detect vehicles up to a distance of 120 metres (nearly 400 feet) ahead, the cruise control system is able to respond proactively. Operating at speeds between 0 and 140 km/h (87 mph), it maintains a preselected speed and a preselected following distance from traffic in front. These functions – including brief stops – are performed via the electronic engine and braking control systems. The system can also reliably detect if another vehicle has come to a sudden stop. In comparison, in heavy, stop-go traffic, the automatic deceleration also includes more vigorous braking, for maximum driver comfort. This ensures that system functionality is matched to the special demands of such situations with their constant fluctuations in speed. The system settings chosen by the driver are displayed in the instrument cluster, and can be quickly scanned at a glance. Drivers can intervene in the operation of the camera-based Cruise Control with Stop & Go function at any time, and remain responsible for the safe control of the vehicle at all times. The Traffic Jam Assistant operates at speeds from 0 to 40 km/h (25 mph) and offers optimal support in dense highway traffic. Just like the camera-based Cruise Control with Stop & Go function, this system – which does not deactivate after a brief stop – maintains a given following distance and relative speed to traffic in front. Along with longitudinal control, the Traffic Jam Assistant also provides lateral control. That is to say, it steers the car as well, via the electronic steering system, keeping the vehicle precisely in its lane and providing an exceptional level of driver comfort. The Traffic Jam Assistant only functions in conjunction with the camera-based Cruise Control with Stop & Go function, which operates over a speed range from 0 to 140 km/h (87 mph). The two systems, which are finely dovetailed, support the driver all the way from standstill up to speeds of 140 km/h (87 mph). The Traffic Jam Assistant, too, is a solely vision-based system, which uses data supplied by the mono camera on the front windscreen. The Traffic Jam Assistant begins operating when a preceding vehicle is detected. A further requirement is a pair of lane markings to allow the vehicle to identify its own traffic lane. Once the system has been activated, the Traffic Jam Assistant begins functioning any time the vehicle slows to a speed within the system’s operating range, for example due to road congestion. Once the traffic has cleared, the driver must first authorize higher speeds either by operating the accelerator or by pressing the RES button on the multifunction steering wheel, which hands over control to the camera-based Cruise Control with Stop & Go function. Although drivers must keep their hands on the steering wheel even when the Traffic Jam Assistant is in operation, they are nevertheless free, in these relatively non-challenging situations, to devote their attention to monitoring and navigating the traffic around them. In situations where the requirements for safe operation of the Traffic Jam Assistant are not met – for example when negotiating narrow lanes through construction, or if the driver does not have his hands on the steering wheel – the Assistant prompts the driver to take over control again. The Traffic Jam Assistant is designed to improve driver comfort and convenience on freeways. It can only be specified in conjunction with a Business or Professional navigation system, which is required in order to identify this category of road. The Traffic Jam Assistant is not available in the US market. BMW Parking Assistant with longitudinal and lateral guidance. The new BMW Parking Assistant with longitudinal and lateral guidance improves parking comfort and safety. As a first step, it assists the driver in the search for suitable parallel parking spaces using ultrasound sensors located on the left and right-hand sides of the vehicle. When a suitable space has been found and the parking manoeuvre has been activated, the system then steers the vehicle impeccably into the space. During this manoeuvre, the system is guided by the same parking sensors used by the static PDC system. The steering function (lateral guidance function) is also supplemented by a new longitudinal guidance function. This function offers unprecedented standards of automated longitudinal control. It switches between forward and reverse gear via an interface with the automatic transmission, and brakes or accelerates via the electronically controlled accelerator and brake pedal. All the driver needs to do is to press and hold the parking button on the center console, while at the same time continuously monitoring the manoeuvre. Even if the parking manoeuvre has to be interrupted – for example because pedestrians are crossing the vehicle’s path, or due to manual intervention in the steering or braking – it can easily be resumed at any time. The new Parking Assistant eases pressure on the driver even in particularly difficult parking situations, the assistance beginning even before the driver presses the button to confirm that he wants to park. When the car is travelling at speeds below 35 km/h (22 mph), the Parking Assistant continuously measures possible parallel parking spaces, both to the left and to the right of the vehicle’s current lane. These are immediately displayed when the parking button is pressed. The system even shows parking spaces which are no more than 55 centimetres (about 22 inches) longer than the vehicle itself. Once the driver has stopped and activated the turn signal to show the system which side of the car the desired space is on, they can then concentrate fully on monitoring the parking manoeuvre, which the system performs automatically and precisely. Once the vehicle reaches its final parking position, the Assistant shifts the automatic transmission to position “P”. All parking information, including the images supplied by the rear-view camera, can be scanned at a glance in the central Control Display, which offers the driver an optimal overview at all times. BMW ActiveAssist – for highest levels of stress relief. Both the Parking Assistant with lateral and longitudinal guidance and the Traffic Jam Assistant offer significantly more extensive functionality than other assistance systems of their kind available today. They provide partial automation and offer far greater assistance in the performance of driving tasks than was ever possible before. Such systems differ, however, from what are known as “highly automated” systems. The latter are capable of relieving the driver of all driving tasks for limited periods. At BMW such technologies, which feature a very high level of automation that provides a significant further boost to comfort and safety, are being developed under the umbrella of BMW ActiveAssist.